Free Shipping Included! Visual Storytelling: Inspiring a New Visual Language by Gestalten at Translate This Website. Hurry! Limited time offer. Offer valid only while supplies last. A new visual language that is both informative and entertaining is emerging at the nexus of information graphics, illustration, and tactile design. A new visual language that is both informative and entertaining is emerging at the nexus of information graphics, illustration, and tactile design. More and more data is being collected. We can access ever more information at any time and from any place. The fundamental challenge now is how to extract the most valuable news, the most surprising findings, and the most relevant stories from the flood of information that is available to us. A new generation of designers, illustrators, and data journalists is addressing this challenge head on. They are developing a variety of new visual forms to depict information that can be classified as visual storytelling. The main idea behind visual storytelling is to take familiar image contexts and use them in a new way. By penetrating meaning and creating associations, abstract correlations can be visualized in a manner that is both easy to understand and aesthetically innovative. Today, visual storytelling is being used intensively in newspapers, magazines, websites, advertising, business reports, and museums. 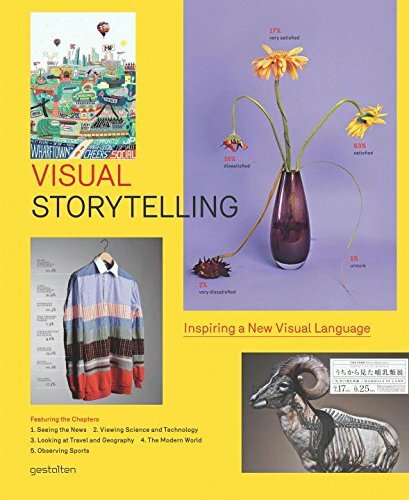 With its collection of inspiring, insightful, interactive, and entertaining examples, the book Visual Storytelling reveals how the contextualization of information is pushing the envelope of today’s design and aesthetics.